SINNER: Sacrifice for Redemption: after committing heinous crimes, a soldier named Adam must embark on a quest for redemption by taking on monstrous bosses based on the seven deadly sins. Journey through bizarre dark landscapes set to a haunting score, giving up stats and equipment before each fight as a payment to undertake each challenge. ﻿Would you be interested in reviewing Sinner: Sacrifice for Redemption? If so, please let us know your preferred platform and region, including Discord or Steam if you'd like a PC build. Discord keys provide access to the Discord store beta. 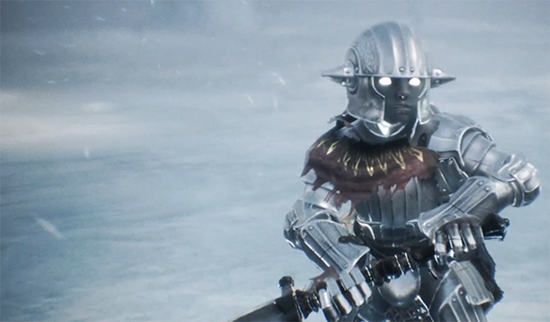 Sinner: Sacrifice for Redemption, the boss battler from publisher Another Indie and the AAA veterans at developer Dark Star Game Studios, will strike at the heart of Nintendo Switch, PlayStation 4 and Xbox One on Oct. 18. Sinner will land the first blow on Windows and Mac as a First on Discord launch title later this year, with a Steam release to follow.